If you are a pond or lake owner looking to grow your sport fish population and improve the health of your pond, fish feeders can be the solution you need. Pond fish feeders supply a reliable food source and added nutrients to help you grow bigger fish. When you take your kids and grandchildren down to the lake or pond, they will enjoy catching more fish or simply watching them feed. Fish feeders can draw more fish to your favorite fishing hole so you will want to spend the whole year fishing. Many people believe that in a well-maintained lake, fish should be able to find their own food to survive. However, the reality is that many pond and lake ecosystems are lacking in plankton, algae and grasses that make up the bottom of the food chain. This shortage of nutrients affects the entire food chain and hinders the growth of larger fish at the top of the food chain. Feeding programs can improve this system by supplying more nutrients to the lake and feeding the forage fish — such as bluegills, minnows, shiners, shad and small catfish — that serve as prey for the larger sport fish. Increased nutrients also support the growth of water bugs that smaller fish eat. Forage fish will eat the feed pellets, allowing them to grow larger and reproduce more quickly. If the population of forage fish is lacking, the larger fish — including trout, bass and catfish — will not have enough food to grow and reproduce. When a lake has plenty of forage fish, on the other hand, large fish populations will grow as well. Fish feeders can help produce a well-balanced ecosystem and a healthy fish community. Feeding your fish can also allow you to catch larger sport fish from your pond and enjoy full and reliable fishing holes. Pond feeders are designed to distribute a predetermined amount of fish food into the pond at regular intervals throughout the day. Texas Hunter Fish feeders feature a powerful centrifugal blower system that dispenses the fish feed over the surface of the pond or lake. The blower allows fish food to be distributed evenly over a larger surface area of water which provides opportunities to feed more fish in the pond or lake. 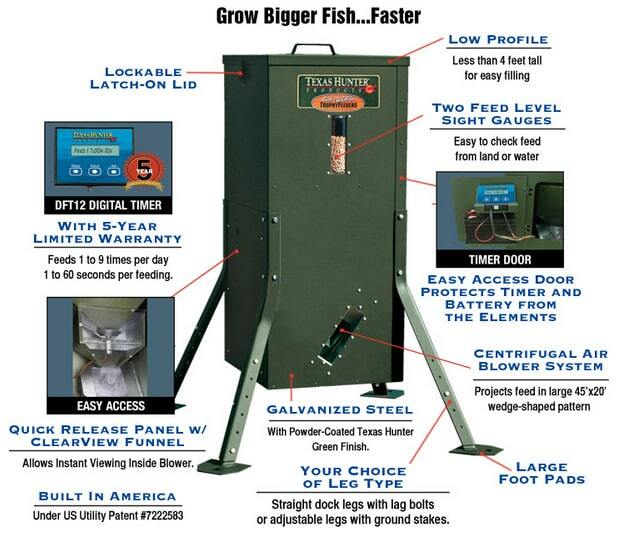 The pond fish feeders at Texas Hunter Products use a dual motor system that provides a consistent volume of fish feed through a built-in funnel system. This metered flow of feed exits the pond feeder through the centrifugal air blower system that delivers the fish feed into the lake. By releasing the food with a precise air blower, the food is distributed evenly across the lake's surface. Food distribution is regulated by the feeder's precise digital timer which synchronizes the two motors in the feeder to turn the feed flow on and off at the scheduled times. The number of times food is distributed daily can be adjusted depending on the size of your pond and how many fish you have. This scheduled feeding is essential because it encourages fish to congregate in the same part of the pond on a regular, daily schedule. Fish will get used to their feeding schedule, and anglers get to enjoy great fishing experiences and improved catch rates for trophy bass, bluegill and other sportfish. Texas Hunter fish feeders for ponds can also be adjusted to release food for a specific duration to supply just the right amount of food to the lake. In directional fish feeders, the food is dispensed over a large area of the pond's surface. Texas Hunter's fish feeder's premium digital timer controls both the intervals of feeding times as well as their duration. Pond feeders supply food for forage fish that become prey for larger fish. Some types of larger fish, such as trout and Channel Catfish will also eat the pellet food. By increasing the population of forage fish at the bottom of the food chain, your more desirable sport fish will also grow larger and become more populous. When choosing food pellets for your pond feeder, keep in mind the species of fish that live in your pond. Determine which population of fish you want to grow to decide which type of fish food to use. When planning how much and how often to feed your fish, consider their population size. If you are providing the right amount of food, your fish should consume all of the food within about five to 10 minutes. Because Texas Hunter fish feeder premium digital timers are completely adjustable and allow you to schedule how many times you want your fish to be fed, you can provide the perfect amount of food to your pond every day. Depending on where you would like to place your automatic pond fish feeder, there are a variety of different types and models of fish feeders available. Each type is designed for a specific application and environment, such as dock or bank fish feeders that sit on the edge of the pond and project feed into it, hanging fish feeders that drop feed down into the lake or project it directionally, across the lake surface. Explore each type of fish feeder to select the perfect design for your pond or lake. Dock fish feeders can be securely attached to your pier, platform or dock with lag bolts and dispense fish feed over the surface of the lake. These stable fish feeders are perfect for attracting fish to your favorite fishing dock and feeding bluegill and catfish that often congregate around docks. When more bluegill are attracted, this will also draw in sport bass. Dock fish feeders can provide entertainment as you watch the fish bite and can create a reliable spot for fishing. Dock fish feeders are available in a range of capacities, depending on how much food you want your pond feeder to hold. At Texas Hunter Products we offer three sizes of dock fish feeders — 70-pound, 175-pound and 250-pound fish food capacity. The dock fish feeders at Texas Hunter have straight legs with foot pads and include lag bolts for securely attaching the feeder to a dock or platform. Pond Bank fish feeders designed to mount on the shoreline have adjustable legs that allow them to attach firmly to the edge of a pond or lake. These stationary fish feeders can be effective for any size of pond and fish population. Texas Hunter's bank fish feeders can be placed anywhere along the edge of your lake where you prefer to fish. Like dock fish feeders, bank fish feeders with adjustable legs that allow you to level the feeder on a slope, can encourage fish to congregate in a specific area of your pond or lake and create excellent fishing holes. Bank pond fish feeders from Texas Hunter have adjustable legs to sit securely on any slope and are available with 70-pound, 175-pound and 250-pound fish food capacity. Our bank pond fish feeders are directional fish feeders that distribute fish feed into the pond or lake in a wide feed pattern. Hanging fish feeders are a unique solution that allows you to drop food directly into the water or project it directionally. With hanging fish feeders from Texas Hunter, you can control exactly where you want to distribute your fish food by adjusting the feeder's removable baffles. 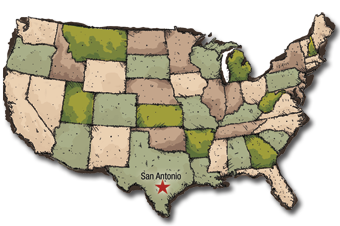 Project your fish feed at 360-degrees, 180-degrees, 90-degrees or drop feed directly beneath the feeder to accommodate any location where you hang your Texas Hunter fish feeder. Hanging fish feeders are secured above the lake using a hanging bracket that's included with the feeder. The hanging fish feeders from Texas Hunter have a 50-pound fish food capacity. A convenient feed level sight gauge allows you to see how much fish food is left in your fish feeder so you always know the feed level in your hanging fish feeder without taking it down or removing the lid. Premium digital timer: Our premium digital timer allows you to schedule up to nine feeding times each day to ensure your fish are always fed at the same time. Feeding duration can be adjusted from one to 60 seconds depending on your fish population and pond size. Patented centrifugal air blower: Texas Hunter fish feeders feature a patented air blower system that projects feed consistently and evenly. Powered by dual motors, our pond feeders release food in a high-velocity sheet of air to effectively supply fish food to your pond. Effective food projection: Our directional lake fish feeders release food in a 20-foot wide and 45-foot long triangular pattern. This projects food evenly across the water and covers a large enough area so all of your fish can be fed. Our directional fish feeders also prevent food from dropping within three to five feet of the feeder. Rechargeable 12-volt battery: Texas Hunter fish feeders are powered by a 12-volt rechargeable battery for reliable long-term performance. Our optional 2-watt solar charger can be mounted on any side of your fish feeder for reliable power all year long. Built-in sight glass: Each Texas Hunter pond feeder has a built-in sight glass so you can check your feed levels quickly and easily. Galvanized steel construction: Texas Hunter pond fish feeders are built to last with galvanized steel and a powder-coated finish to withstand the elements and protect against rust. Lockable lid and access door: Our fish feeders feature a lockable lid to keep your fish food fresh. The lockable access door protects the fish feeder's timer and battery from the weather. Texas Hunter automatic pond fish feeders are designed to help you grow bigger fish faster and manage your pond's ecosystem easily and effectively so you can spend less time maintaining your pond and more time enjoying it. Water level fluctuations: If your pond's water levels change dramatically, a dock fish feeder may be the right choice for you. Bank shape: Bank fish feeders have adjustable legs that allow them to be positioned on nearly any type of surface, including slopes and uneven terrain. When choosing where to place your fish feeder, look for an area where you like to fish and a place where your fish feeder can be placed close to the water. Dock location: If you have a dock that you like to fish from, a dock fish feeder can be a great option. Pond size: Our pond fish feeders project fish food up to 45 feet, making them perfect for most lakes or ponds. If you have a very large pond, you may consider having two or more fish feeders to place in different locations around your pond. Texas Hunter fish feeders for ponds and lakes are designed to deliver reliable fish food for your fish with no hassle for you. Our automatic pond feeders allow you to set up to nine different feed times daily and control exactly how much food your fish receive. By supplying ample food for your pond's forage fish, your sport fish will grow larger and more quickly. When your fish get used to a regular feeding schedule, you can also enjoy great fishing holes every day. Pond fish feeders will draw fish to the feeding zone, so you always know where the fish will be biting. 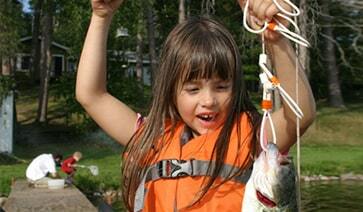 This makes fishing more fun for the whole family, as your kids or grandchildren are more likely to catch a fish. You can also enjoy the entertainment of watching your fish feed as well as observing their growth up close. Flexible placement: Texas Hunter fish feeders run on a rechargeable battery that allows them to be placed almost anywhere around your pond or lake. Our optional solar charger keeps your fish feeder's battery charged all year round. The solar charger can be installed quickly by attaching it on any side of your solar fish feeder to maximize the sun's energy. Variety of models: Texas Hunter offers a variety of dependable fish feeder models so you can choose the capacity and mounting method that best suits your needs. Easy to maintain: Our automatic pond feeders allow you to grow your pond's ecosystem with very little maintenance. You can trust your pond feeder to feed your fish at the same times each day, and the feeder's durable construction allows it to withstand even the harshest weather. Cost effective: Pellet fish food is the most cost-effective option for supplemental fish feeding. Two pounds of fish food produces about one pound of fish growth, while stocking forage fish requires ten pounds of fish to produce one pound of predator fish growth. This makes pellet fish food a much more affordable and efficient way to grow bigger fish. Catch bigger fish: When your pond ecosystem is supported by supplemental fish feeding, you will be able to grow and catch bigger fish. Whether you are hoping to catch a trophy bass or hook a large trout, fish feeders can boost your chances of success. Fish feeders from Texas Hunter Products are a reliable and affordable choice for growing bigger fish and supporting your pond's ecosystem. Browse our automatic pond fish feeders today to find the perfect model for you. Take a minute to browse our inventory of fish feeders and place your order securely here on our e-commerce site. If you have questions or need assistance, give us a call at 800.969.3337 or contact us online at your convenience.